Some companies are helping their workers tackle the mounting debt, offering student loan assistance as a benefit. 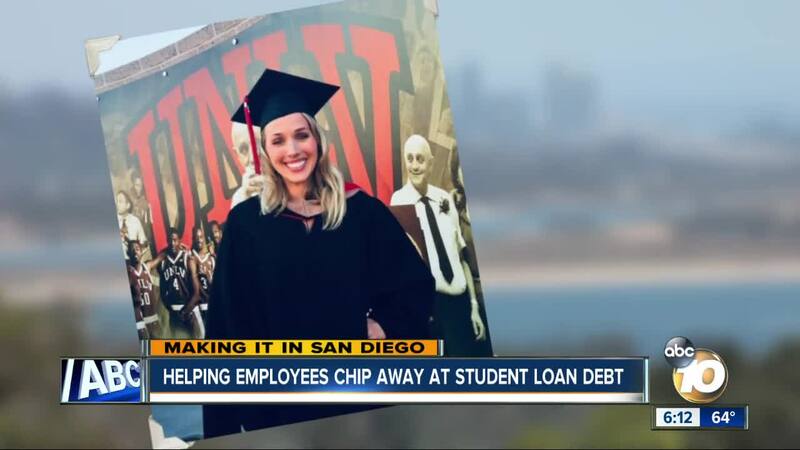 SAN DIEGO (KGTV) - Student loan debt is crippling tens of millions of people, more than credit card debt and auto loans. Now some companies are helping their workers tackle the mounting debt, offering student loan assistance as a benefit. Fidelity Investments is one company leading the way with its Step Ahead Student Loan Assistance program. “We look at our jobs day-to-day and we try and figure out how we can help people make the right financial decisions in their lives and it was something holding back some of our folks here at Fidelity," said Jared Roethlisberger, a Fidelity Branch Manager in Mission Valley. "They couldn’t save for retirement or they were working on saving for that home, and this allows us, Fidelity, to help those associates be able to take a little bit more home in their pocket." Employees who’ve been with the company for at least six months are eligible for $2,000 a year toward their student loans up to $10,000. Fidelity started offering the benefit in 2016 and more than 9,300 employees have saved over $32 million in principal and interest. The company says employees are able to pay off their loans five years sooner and lifetime costs were reduced by about $20,000. Roethlisberger says it's not only a benefit to employees but to the company, helping with recruitment and retention of employees. “I also think it just makes folks happier, we see better retention of employees and happier employees," said Roethlisberger. Now the company is helping other businesses offer the benefit to employees, launching the Student Debt Employer Contribution benefit in 2018. According to data from Fidelity's website, 86 percent of young people would commit to their employer for five years if they helped pay off their student loans. More than 55 companies are now making plans to offer the program and there are 10,000 active participants. Some companies are also getting creative, like providing an option to transfer carry-over paid time off (PTO) into a payment against student debt. Despite Fidelity's success, few businesses overall are offering this benefit. A 2018 survey by the Society for Human Resource Management found only 4 percent of organizations offered financial aid to help employees repay student loans, the same as in 2017. Some lawmakers hope to change that, proposing a bill which would allow employers to give tax-free student loan assistance. Borrowers can also consider student loan refinancing; combining your existing federal student loans and private student loans into a single, new student loan with a lower interest rate. Make Lemonade, a free personal finance website, has created a list of their highest-rated refinance student loans and student loan consolidation options.